If creativity is a gene, then it's one that we continue to pass down in my side of the family. My grandmother was creative, my mom is extremely creative, I consider myself decently creative... and my girls? Well, they'd dive headfirst into a pool filled with art supplies if they could. However, while they love open-ended crafting abilities, I've found that they're even more excited when they are given a little inspiration, some direction, just about anything bright and colorful, and a whole lot of glitter. Are there girls who don't like glitter? I haven't met them yet. 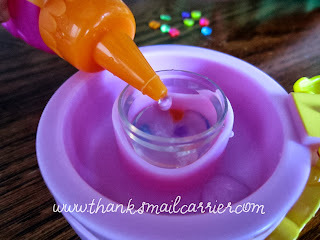 Most recently, we've all been enjoying the ability to get our creative juices flowing with a new product that allows girls to make, fill, create and even wear their sparkling, pint-size creations: Glitzi Globes. New to the world of do-it-yourself crafts from Moose Toys, Glitzi Globes are the create-your-own snow globe toys that allow young users to make 'em, shake 'em, and show 'em! Girls simply use the included materials to assemble each adorable miniature glittery globe and then turn it into a pencil topper, jewelry, decor and more. With 24 characters and six themes to design and collect, these colorful arts & crafts are sure to bring a smile. 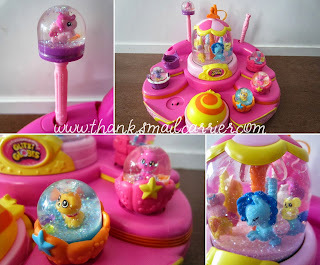 Knowing that my girls love crafts, glitter and animals, I had no doubt that Glitzi Globes would be the perfect combination of all three to grab their interest. Looking over the Glitzi Globes Three Pack, Glitzi Globes Starter Kit and Glitzi Globes Glitzi Showcase, the girls couldn't get enough of the variety of colors and the charming faces of all of the cute little animals and were eager to get to work. 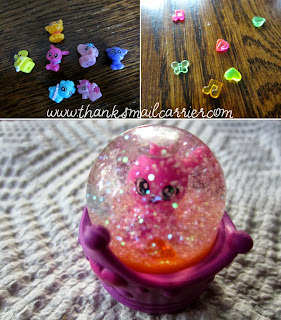 Immediately opting for the Glitzi Globes Glitzi Showcase, we looked over the contents and couldn't wait to get started. 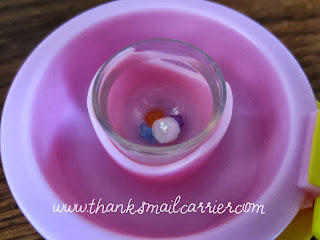 Although I was initially a little hesitant wondering about the amount of mess or help that the girls would need in creating their mini snow globes, the clear, step-by-step instructions eased any worries that I had. ...and the top is pressed down firmly onto the bottom to assemble the globe. Voilà! Then simply open the globe maker back up and your colorful, whimsical creation is completed and ready to wear or display. 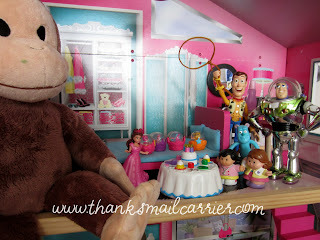 The girls loved getting to pick between all of the cute characters, fun little deco shapes and more. Not to mention that the end result is so sparkly and unique! Once all of the Glitzi Globes were finished, the girls immediately had fun interchanging them in the different color Glitzi Bases, adorning the top of their pencils or turning them into jewelry. ...the completed Glitzi Showcase was the perfect place to display each and every one of our sparkly creations! While I wouldn't suggest it as a common occurrence, I appreciated that the Glitzi Globes instructions also gives directions on how to reopen the globes in case you forgot to add in one of the components or your child desperately needed to switch to a different character. For now, however, the girls are extremely excited about their sparkly, artistic creations and have loved moving them from place to place around the house and incorporating them into their pretend play with other toys. When can I attend a party that has Curious George, Glitzi Globes, Little People, a princess, Woody and Buzz, and Sulley in attendance? 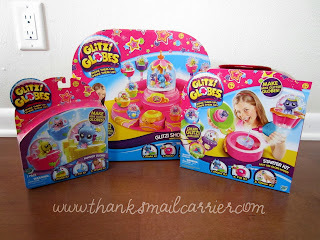 Designed for ages 5 and up (although Little Sister B had no problem completing all of the steps on her own at age 4), Glitzi Globes are a unique and fun activity for girls everywhere. I can't think of another toy that results in custom, handmade snow globe accessories to wear or display anywhere you please! 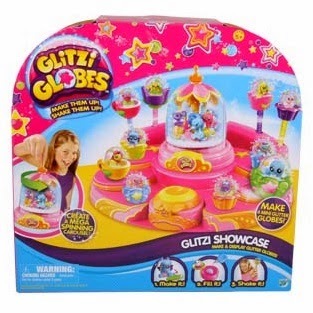 To find out more about Glitzi Globes and to see if they'll make a great gift for the girls in your life this holiday season, visit GlitziGlobes.com and connect with them on Facebook. Each of the kits retail between $7.99 and $19.99 and can be found nationally at retailers, including Toys 'R Us and Walmart, as well as online from Amazon.com. 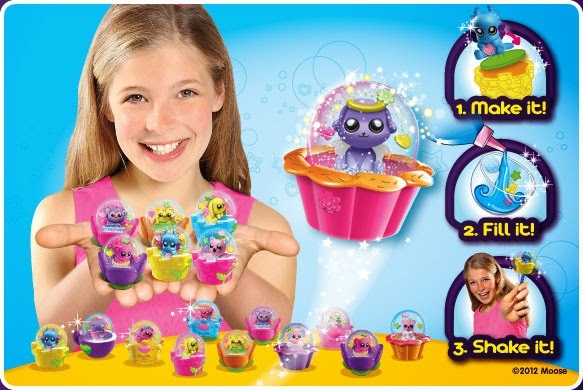 One lucky person will win a Glitzi Globes Glitzi Showcase! A big thank you to Glitzi Globes for providing the above three products for me to review as well as a Glitzi Globes Glitzi Showcase for one lucky giveaway winner. The opinions shared are my own and honest and if you really need to see more, click here to see how I roll. I like that the child gets to make the globe. I love that the kids get to interact and do it themselves! 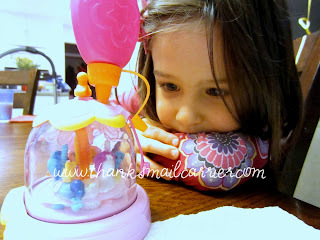 My daughter absolutely loves and collects snow globes, would love to win this! I like that's easy for my daughter to make the snow globes. I like that the child can make something from it themselves, instead of you making it for them. Hoping to win, my great niece would love this and it would be a nice Christmas present. thank you. I like that it is completely up to them how to design the globe! I like the ingenious way the bottom attaches to the lid so the water doesn't spill. I like the clear, step-by-step instructions. I love that it is so child friendly even for younger kids. I like that you can change them around even after you are done. I like that the child is part of the process of 'making' the toys. I like that it comes with instructions to reopen the globe in case you forgot something. I like that the bases are interchangeable. My favorite feature is how easy these are to create! I like that it is completely up to them how to design the globe. I think it would be fun interchanging the bases, I like this! Teaches girls to be creative and it's fun. My daughter loves to look at snow globes so I love that she can create one of her own and enjoy it! I like that they give you directions on how to reopen the globes in case you forgot to add in one of the components or your child needs to switch to a different character. I like how easy it is, and my 7 yr niece could do it. OH boy will the girls LOVE these!! I am glad I stumbled in today and read about them. I plan on ordering some right away, for Christmas gifts. they ADORE crafts so much more than most toys. I want to get the 3 pack. They look like fun, and they are reasonably priced. Just the concept a child can create from start to finish is great for their imagination and resources. I like that they can showcase them and that everything you need is in one box. i think the little girl i would give this to would love it! snow globes of any kind are so cool!!! I like that's easy for my daughter to make the snow globes. Thanks so much for the fantastic giveaway! I like that my daughter would get to make (and customize) her own globe. She would love this. I like that it seems easy enough for my daughter (turning 5 soon) could help and not make a huge mess. I like that the glitter starts out as a pellet; good way to keep it contained. I love that it is small, cute and low mess! Thanks for the giveaway! I like that it is something that my daughter can do herself. She loves making things and then displaying them. I like that kids can do it themselves and it seals well! I like that my kids can use their imagination and get creative. I really like that you can use them as jewellery as well. Thanks for the great giveaway opportunity. Keep up the terrific blogging. I like that the children can use their imagination to make the globes. I like that a child can make these themselves and use their imagination in what they make, I think this would be a lot of fun for my granddaughters. I like that the child gets to make the globes themselves. I love the creativity aspect. My daughter would love picking the characters out. I like how easy it seems. I like that kids can be creative with it. I like that it has instructions but its also very easy! I love the fact that you can build it yourself, what a great idea. Thanks for the giveaway. I like the face that you can put it together with your kids because it is so simple. I like that they can use them in different ways when they are made. I like that my daughter can make her own globe. I like that it's easy to make and my kids can get really creative! I love that there are so many choices for them to be creative. I commented on Back to the Beginning: Monsters University Available Now! I love the cute little animals that go inside, so adorable! I love these. I like the cute characters that can be put in the globes. I like that they can be made into pencil toppers or jewelry. Thanks. I love that the kits include more than one. My child always seems to want to share with her friends. I would just enjoy the one-on-one time with my eight year old. I have seven year old twins as well, and try to do something unique with each one, and this could be something different and a memory maker, for sure!!! I like that this is a creative project that allows kids to make something. The fact that they are cute and colorful is a bonus. I love they can use so much creativity in making it unique. 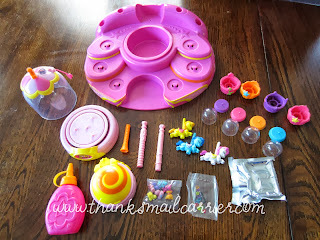 The feature I like most...it will keep my little one entertained. I like that there's different options (pencil topper, jewelry) to do with the finished globe! I like that these are a craft that can be worn or displayed. I think the instructions look like they're easy to follow. How to reopen the globes in case you forgot to add in one of the components or your child desperately needed to switch to a different character. it gives my kids something to do while being creative. They will be proud of what they made and can give them as christmas gifts. Looks easy to make and fun, too. I like that it's something my daughter can make on her own. I like that it's DIY because it's always fun to have something they made themselves. I like that it's a hands on activity for kids - my daughter could make these for gifts and be proud she did it herself...and she's been asking me to get these for her. I like that it isn't too complicated to figure out. Very cute, my daughter loves doing crafts, she'd really enjoy this! I like how easy it is for the child to make the globes. I like that the product is user friendly so that the kids can do this on their own with little to no supervision. 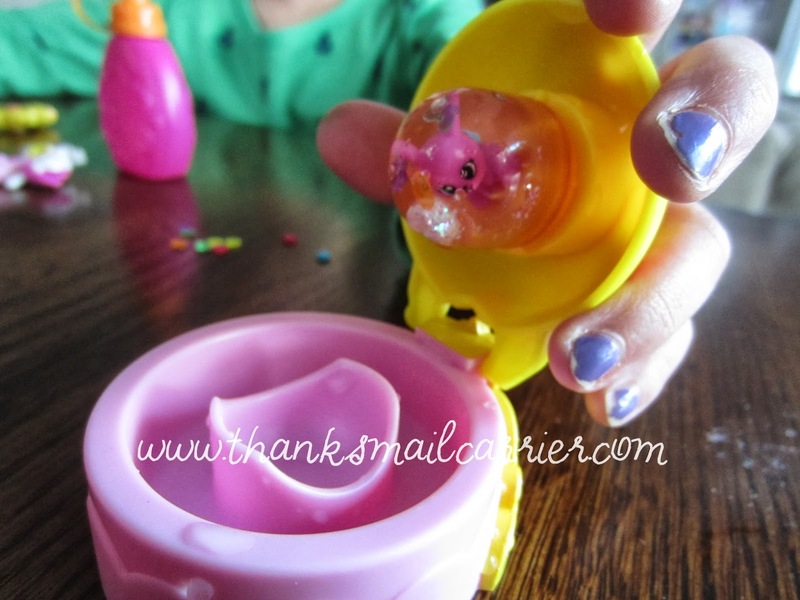 I like that my niece loves crafts and that I've found a great one for her to do! One of the features I like on Glitz Globes is that you can reopen the globes in case you forgot something or you want to switch to a new character. 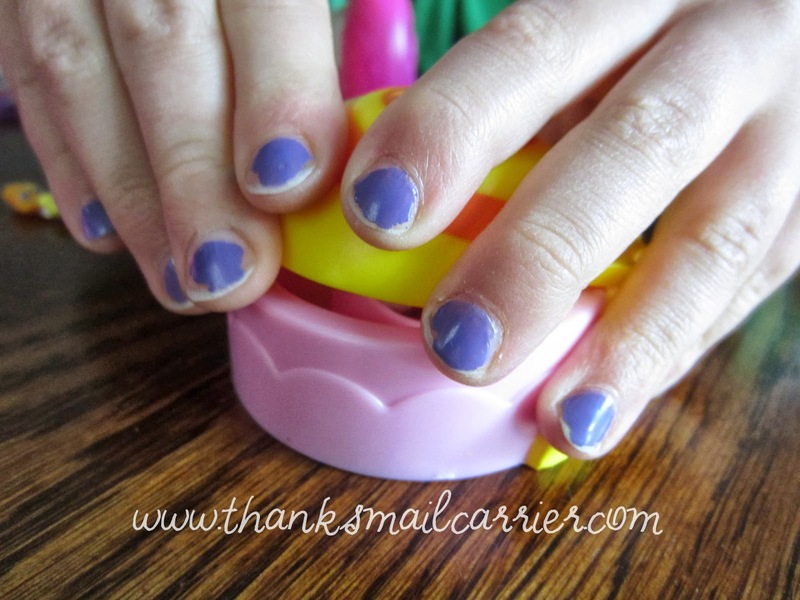 Love how easy it is for kids! I like that the kids can be creative in making their own globe. I love the size of them! I love that it's a craft that children can do by themselves without too much mess! I like that the globes are small for tiny hands! Kids can design their own snowglobes. Love that it is a project the kids can make, but the end result is something they can continue to use! I love that not only is it something my daughter gets to make for herself but it is something she can actually keep and display for a long period of time. i like that you get to pick the character and put it all together! I like how it is not electronic. The kids will enjoy doing this and it is using their own hands. I love that they are customizable. Such a great idea! 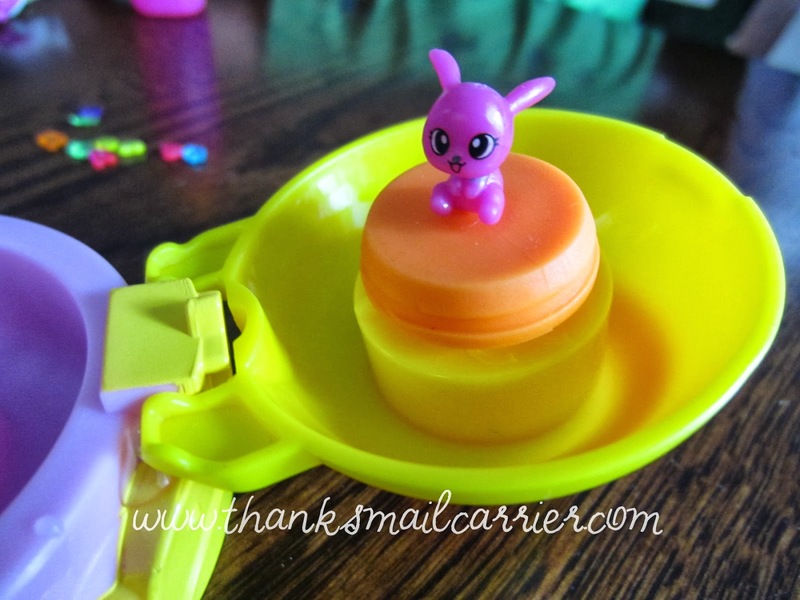 A great craft toy for girls! I love that the bases are interchangeable and that there is a showcase for the completed projects! We never know what to do with many crafts when we finish, so having a place to keep them is fantastic! Thanks! I like all the different colors. I like how the bases are intechangeable and that it looke pretty easy to do. I like that you can change the bases. It seems like it would be more fun for the little ones that way. Thank you! I love that the kids get to make the globe themselves - it is awesome! i like that its so easy my daughter could do this on her own. I like that the Glitzi Globes instructions also gives directions on how to reopen the globes in case you forgot to add in one of the components or your child desperately needed to switch to a different character. I like how easy it is for my daughter to make. I like how this project is something that would really be exciting for my daughter, but not too difficult. my daughter would love to pretend to be an elf and make the toys! How cool! I like that there are so many little creatures to choose from. I like that it is unique and seems like something my daughters would love. I like that they get to make them by them selves! I like the little showcase that they can display all of their snowglobe creations on too besides the entire concept is really cool. I like that this is a fun and unique gift for kids. The showcase is real nice to display the globes that they made. I love that they are easy to put together and that they are so cute! They are something that me and my nieces could make together. I love that it teaches children creativity, I would love it for my niece!